While we were relatively unscathed by Irene, we were hit harder by the no-name pre-Halloween nor-easter, which we have dubbed “F*&@tober.” While we were out of power for 53 hours (it came back Halloween night), many of our friends still have no power and are expecting to get it back by Saturday. That would be a week after the storm knocked it out. 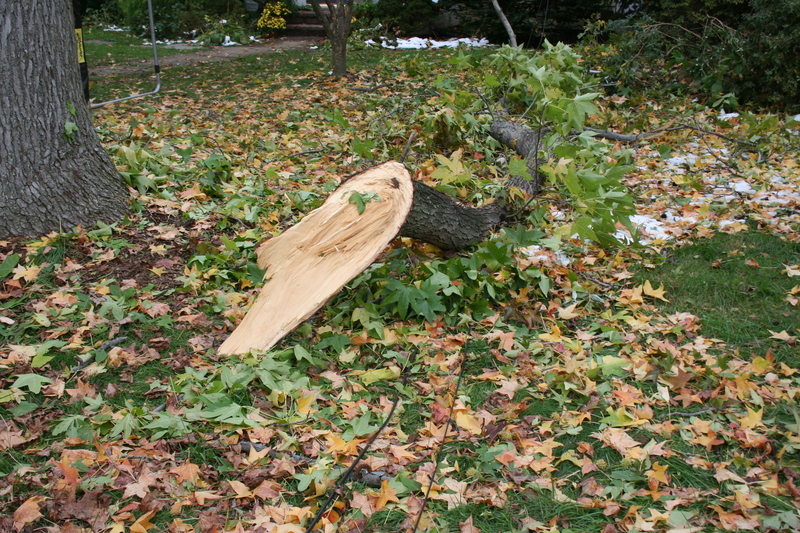 This storm was said to be much worse than Irene, at least for trees damage and lost power. 700,000 people in New Jersey alone lost power (I think Connecticut had a similar number, in a smaller, less densely populated state). 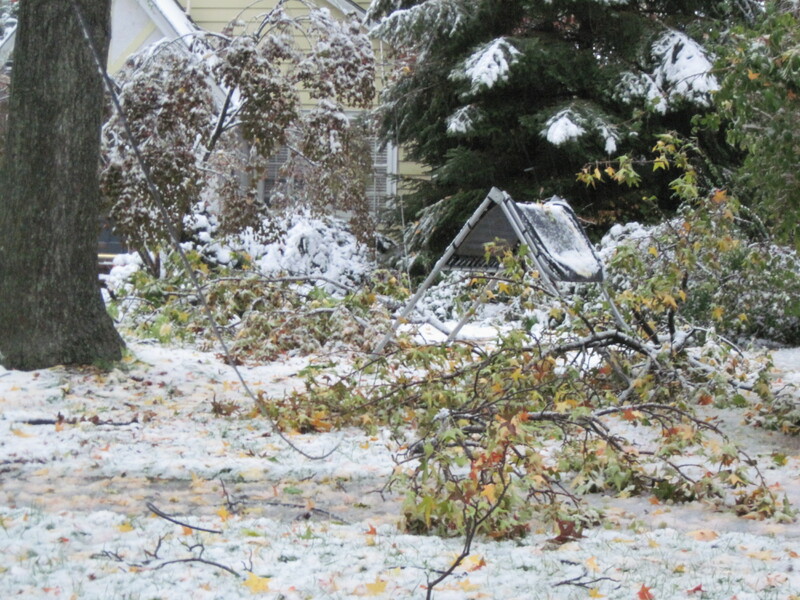 As of today, about 192,000 in NJ are still lacking power. 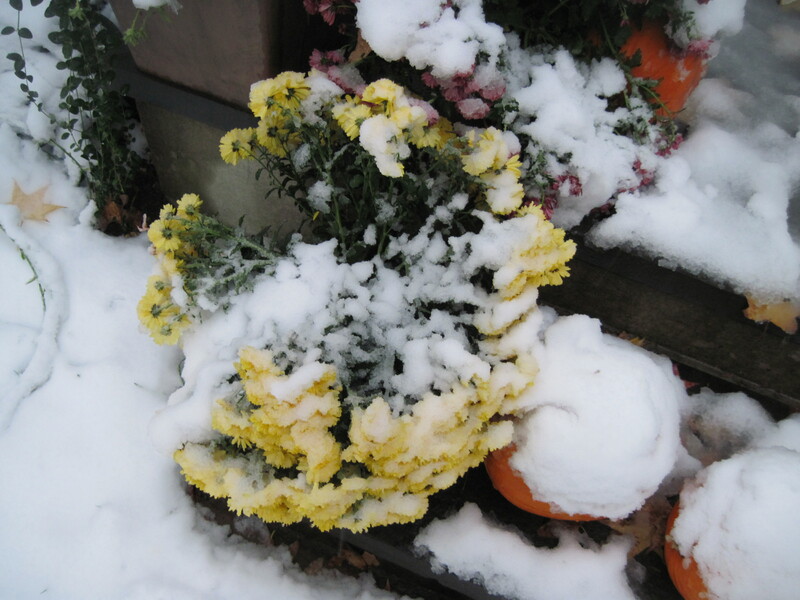 We knew there was predicted snow last Saturday, but it was thought that it would be further north in New Jersey. We anticipated rain only. So it was a little surprising when it started falling around 10 a.m. A few hours later we started hearing loud cracking sounds that sounded like thunder. Sitting in my office (which has large windows on 3 sides), I watched large limbs falling from my neighbor’s front yard trees. 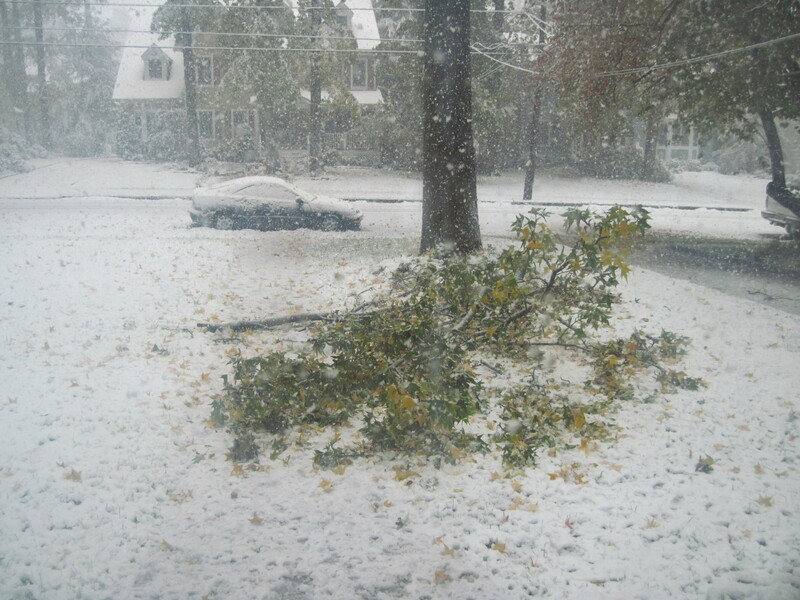 Then one from our tree came down across our front walkway. 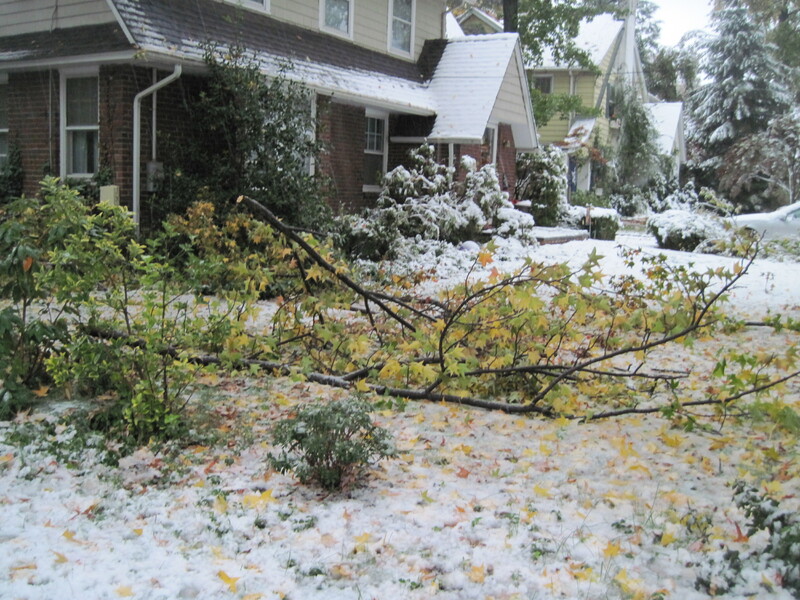 When Mark came home from lunch with the kids, I made him move the car to the street, so the car wouldn’t be underneath the phone and electrical wires, and there were fewer tree limbs that could hit the car in the street. I’m guessing our town only got a few inches, but some New Jersey towns got more than a foot. 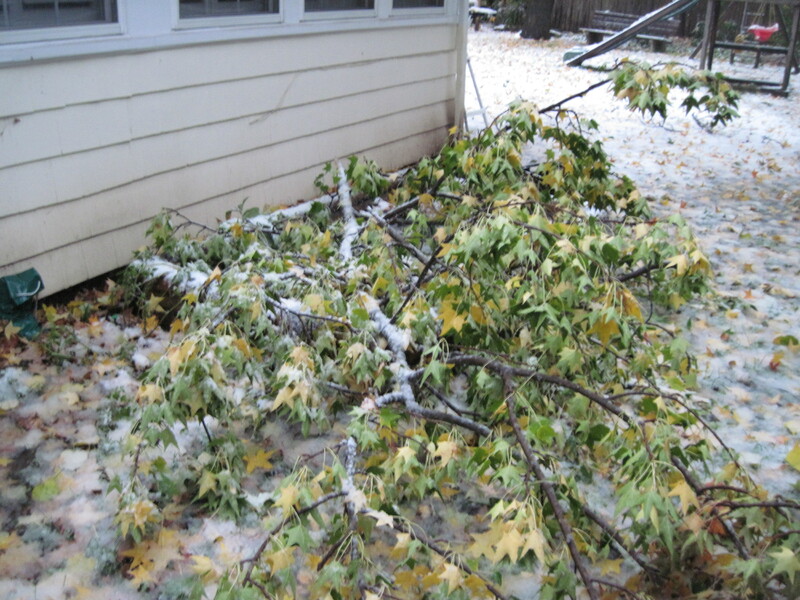 Most of the leaves are still on the trees, so with heavy, wet snow on top of the leafy trees, the branches just couldn’t take it. A giant branch fell right on my little garden, which was still producing small green peppers. Mark said that was god’s way of telling me to stop gardening. 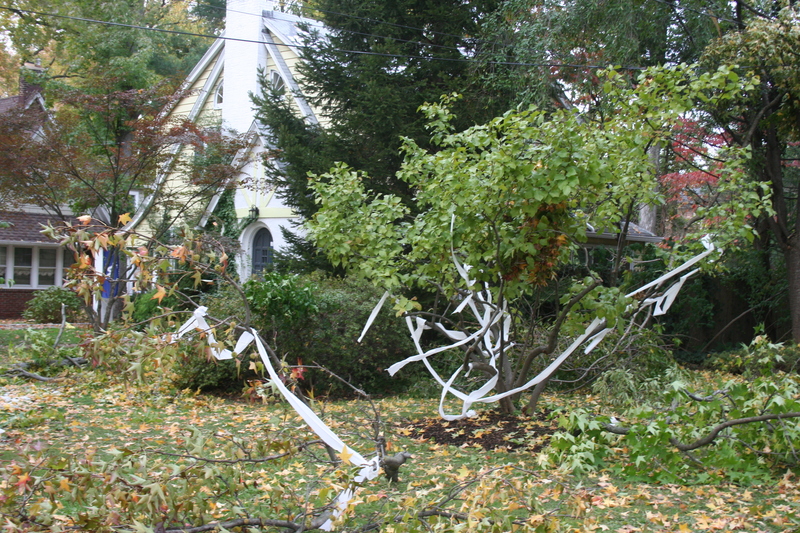 The kids went to a Halloween party Saturday night, and we dodged the tree limbs that were dumped in the street, and had to take numerous detours to get around streets blocked from downed wires and trees. The kids had fun at the party (thanks Jeff and Lori!) and Zack won the costume contest (with Dori a strong contender as well). Then it was home to sleep in our cold, dark house. Fortunately we have a lot of blankets, so we were toasty in bed, but waking up to a 50 degree house Sunday morning was another story. Our hardy children are used to a cold house, and camping acclimatized them as well. Unfortunately, two of our tropical Betta fish were not so lucky, and did not survive exposure to 47-50 degree temperatures. Religious school was cancelled, and our awesome neighbors used their small generator to power up the coffee maker, delivering us a carafe of coffee (and milk!). I would have put that in this post even if they hadn’t asked me to mention them. 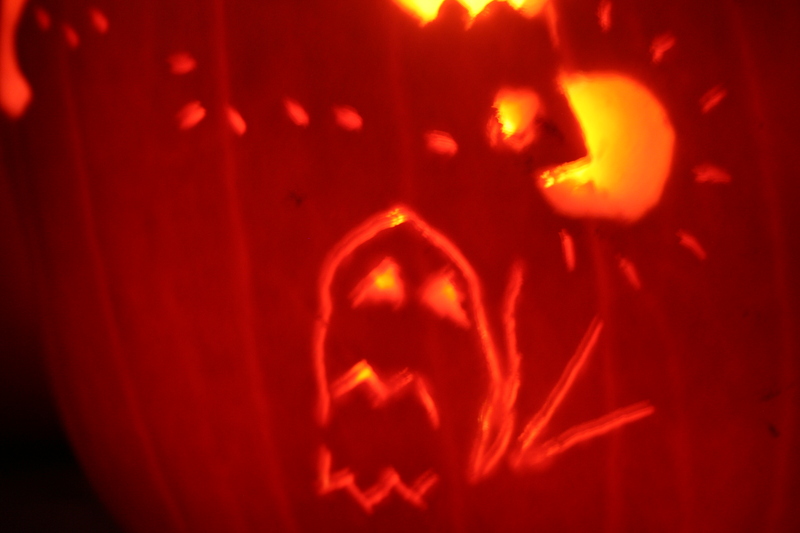 As it was the day before Halloween, we had to do the ritual pumpkin carving, not so easy in our dark kitchen. And we weren’t smart enough to bring the pumpkins inside earlier, so scooping out cold pumpkins was not a lot of fun. Mark invited our family to someone else’s house to watch the football game, and Dori and I went to the library to get our laptops and my phone powered up (and to check email). Everyone in town had the same idea – we finally found the last two outlets, only to discover that the library’s wi-fi was down. I almost cried. So we headed the football house as well, and our friends were kind enough to store our freezer food and feed us (plus give us power/internet). 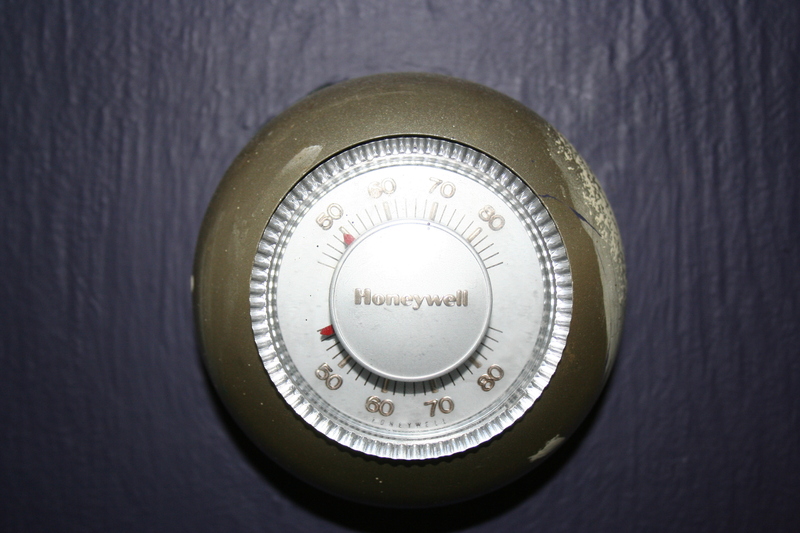 That night was much colder – below freezing (which meant I could put some of the fridge food outside for the night). Monday morning, Dori’s Betta was dead, and my office thermometer read 40 (though it could have been lower, since that’s where this thermostat stops). We had wrapped her other fish tanks up in towels to retain some of the heat. While we had slept at the house, many in our area bunked out at hotels or on friends/family’s couches (we did have lots of offers from generous folks). The kids had school on Monday, unlike several neighboring towns which were out for 1 or more days. 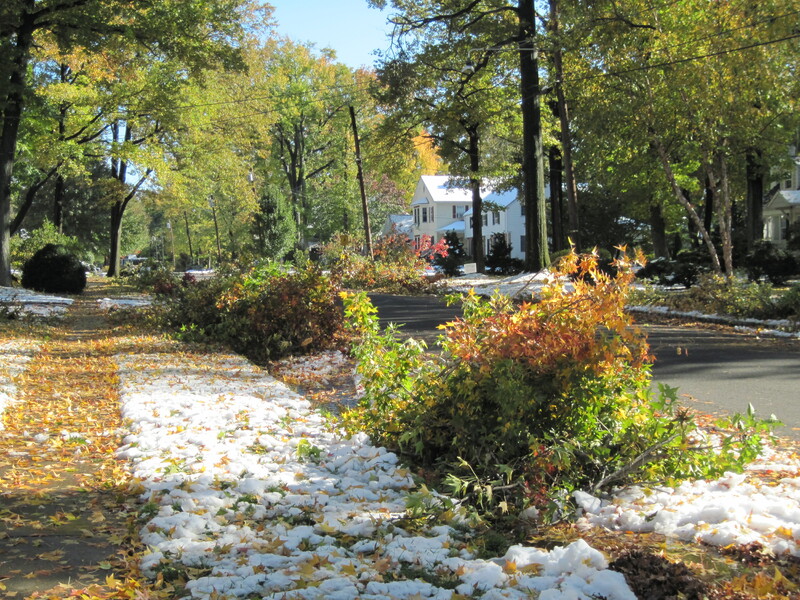 Between Irene and F*&%tober, Cranford has used up its snow days for the year. Any more snow and they’ll start losing spring break. Mark showered at the office, and after dropping off the kids at school, I showered at the gym and went to Barnes & Noble to check email. 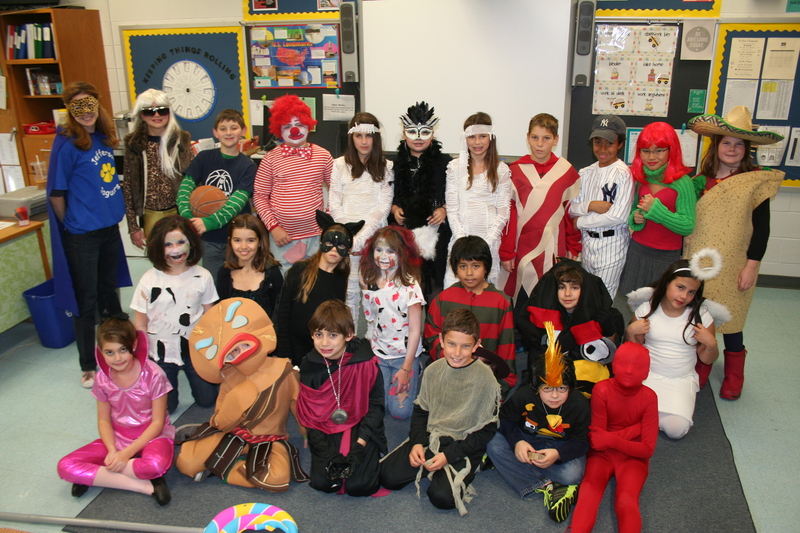 Halloween, of course, is quite an ordeal at school. The kids usually come home for lunch to change into their costumes (though I convinced Zack to stay at school, where they have heat). It turned out to be a beautiful day, where it was warmer outside than it was in our house. 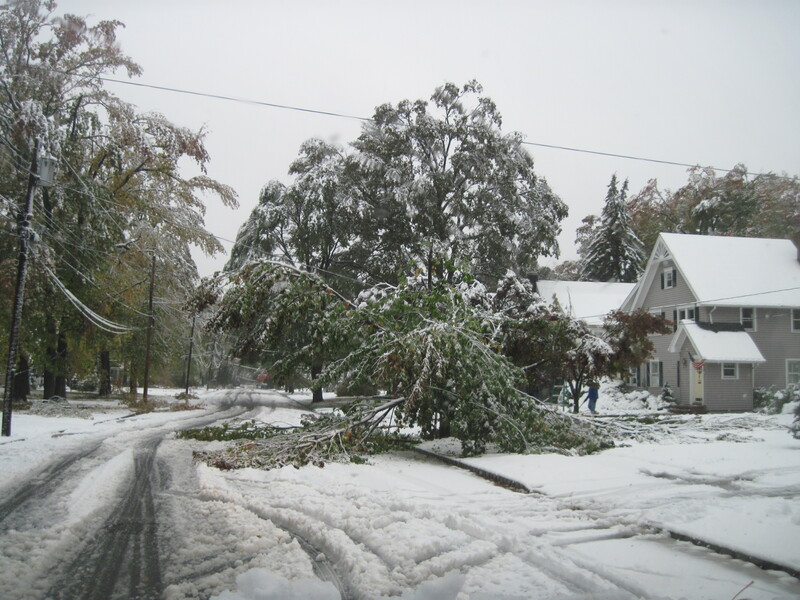 The school parade happened, though the kids were rerouted in order to keep them away from fallen branches, the snow, the mud and the large branch still (6 days later) dangling from the power line. They had class parties, then headed home at the day’s end to get ready for trick-or-treating. 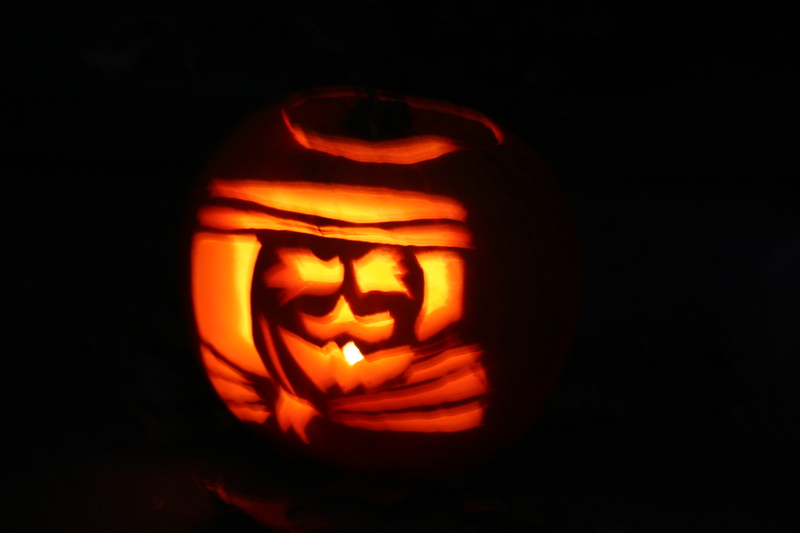 Some towns officially delayed trick-or-treating for safety reasons. While every year I complain about having to trick-or-treat in the daytime, it was actually good to do so this year, because there’s so much debris in the streets and on the sidewalks. Many areas are cordoned off with caution tape as well. We went around the neighborhood, ending on our street as night was falling. You couldn’t tell who was home because everything was dark. We thought we should give out tricks instead of treats, inviting the kids into our cold dark house to see how long they survived before running out, shrieking in terror. We saw the electrical truck at the end of the street (which is still blocked today off because of a tree and wire) and we found out we’d be getting power back within the hour. After giving the guy some candy, we headed back to the house to gather supplies for an impromptu street party. Surprisingly, the wine and beer from the kitchen fridge were still cold, and we all cheered when the power switch was flipped. And Dori’s Betta? 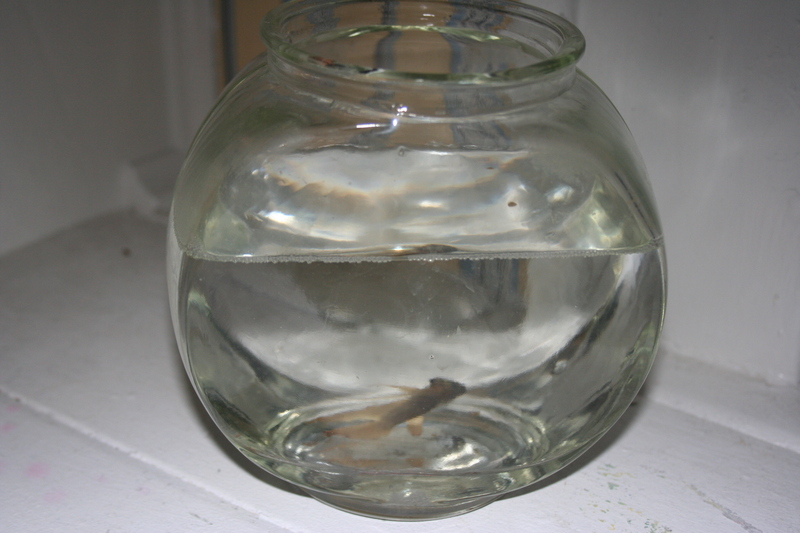 She saw it stir a little, and after changing the water from frigid to not frigid, the fish came back to life. A F*&@tober miracle! the leaves are changing color, but now they’re in the street attached to branches. I was surprised how worn out I was after just 2 days with no power, and feel immense sympathy for those still without. Some of those friends seem to be at their breaking point, which is how I felt. Given that I still don’t have a smart phone (I’ll be getting one soon), I felt very out of touch. My phone battery doesn’t last long. They keep saying how unusual the weather has been in New Jersey these past few years. Of course, that’s all we Kaplans know. wow. I’m familar with those streets so it so saddens me to see those big old trees damaged or dead. thinking of you annd I hope you have a warmth-filled weekend! What is Jen eating today?